Reasonably priced and plentiful at the local fish market, sardines are a staple ingredient in Italian cuisine. A popular way to serve sardines is Neapolitan style, with fresh tomato and basil, or sarde in soar (sweet and sour sardines). In this dish, wine marries with the sweet taste of white onions, and sarde in soar is readily available in rustic wine bars and at Venetian tables. The simplest things are often the best, and this sardine recipe uses a small number of ingredients to create an impact. 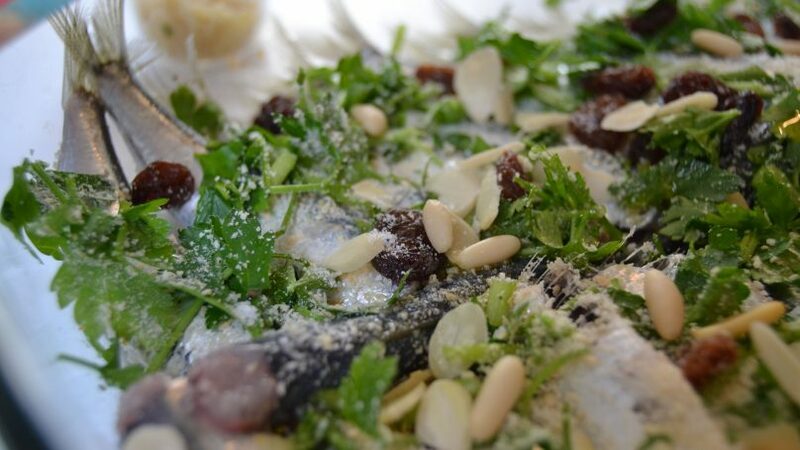 This recipe works not only with sardines, but also gurnard, herrings and mackerel. And the most important ingredient? Magic. Yes, my friend. Don’t be surprised if when tucking into this dish, you feel like you’re having lunch on a terrace with a sea view. You’ll just need sunglasses, and maybe a glass of Soave as the clamorous waves hit the shore. Clean and prepare fish, or ask your fishmonger to do this for you. To prepare the sardines, remove its head so the intestines are easier to remove. Gently wash the fish in cold water. Pour extra virgin olive oil on to a baking tray, then sprinkle the olive oil with breadcrumbs and raisins, season with salt and pepper. Spread sardines out on baking tray, on top of the olive oil, breadcrumbs and raisins, leaving some space between each fish. Optional: Squeeze fresh lemon juice on top before serving.